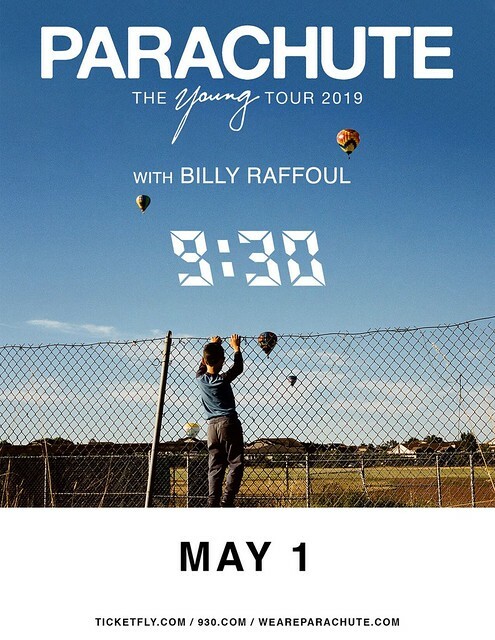 Posted on 04/17/2019 by Parklifer	in Preview and tagged 9:30 Club, free tickets, Parachute, soul, ticket giveaway, Virginia. Will Anderson (vocals, guitar), Johnny Stubblefield (drums), and Christopher “Kit” French (saxophone, keyboards) formed Parachute more than a decade ago when they were still in high school. Now the gents from Charlottesville will release a new self-titled album on May 10 via Thirty Tigers. Parachute performs at 9:30 Club on Wednesday, May 1, and you can win tickets to go with Parklife DC. 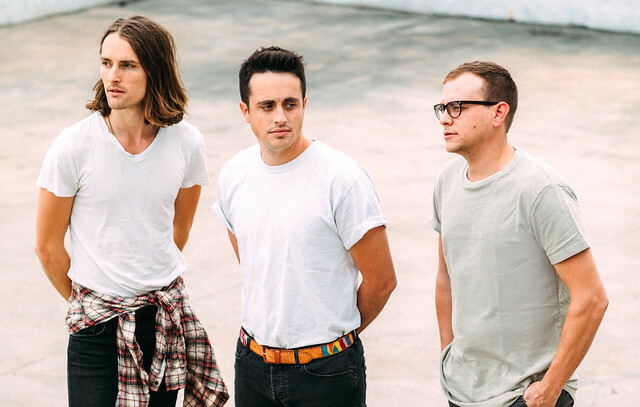 Update: Parachute has sweetened the deal — our winner also gets their picture taken with the band at 9:30 Club! Parklife DC is giving away a pair of tickets to see Parachute at 9:30 Club — and a picture with the band! To win, simply leave a comment on this blog. You can leave any comment, but we would like to know your favorite song by Parachute. Comments will be closed at 5pm on Friday, and a winner will be randomly selected. The winner will be notified by email. The winner must respond to our email within 24 hours, or they will forfeit their tickets and we will pick another winner. We will email you instructions on claiming your tickets and photo op. Good luck! Buy your tickets online if you don’t win. I LOVE PARACHUTE. Their song “She” is incredible and helped me through an interesting time in my life. Hope I win these tickets. My girlfriend loves Parachute and always talks about them. We’d love to see them again! One of our favorite songs is Jennie. Me and my friend love this band. My favorite song is American Secrets. My friend and I love Parachute! Our favorite song to sing together is White Dress. my BFF loves Parachute!! She has been obsessed with them since she heard them in middle school and hasn’t stopped listening ever since. The song Forever and Always is one of my faves and I always have it on repeat! Seeing them in concert would be a dream come true! Parachute is amazing! My little sister got me into them and I just love everything they put out. My favorite song of theirs is What I know. Parachute is so great! Would love to win these tickets. “What Side of Love” is an extremely catchy song! I love Parachute, they’re one of my favorite bands! My favorite song by them is She is Love! My friend and I are dying to go see Parachute! They are extremely talented and their music has been such a big part of our lives. We would looove to win these tickets, it would mean the absolute world to us. My favorite song by them is “Kiss Me Slowly”. My favorite song is She is Love! My friends and I love love LOVE Parachute! One of my favorite songs is Forever and Always!! I love Parachute! My favorite song is meant to be! It would be my best friend and I’s dream to win these tickets and see Parachute who is by far our favorite band! We listen to them together all the time and our favorite song is Kiss Me Slowly. Winning tickets would mean the world !! I love Parachute! My favorite song is She is Love! Love Parachute so much!! My favorite song by them is Disappear. I would be so happy if I won these tickets, me and my best friend have been listening to them for so long! My college roommate and I really love this band and plan on attending another concert. My favorite song is kiss me slowly. I’d love to surprise my best friend with a pair of tickets! her 25th birthday is a week before the concert and i know she’d greatly appreciate it! My favorite song is She (for liz). I can listen to it forever and never get tired of it. Thank you for this opportunity! My friend and I love the band, and our favorite song is Disappear! We would love to see the band in concert! My friend and I LOVE this band!!! Our favorite song is Didn’t see it coming and we would so love to win tickets!! It would be a dream for my friend and I to see this band in concert!! My favorite song is The Other Side!